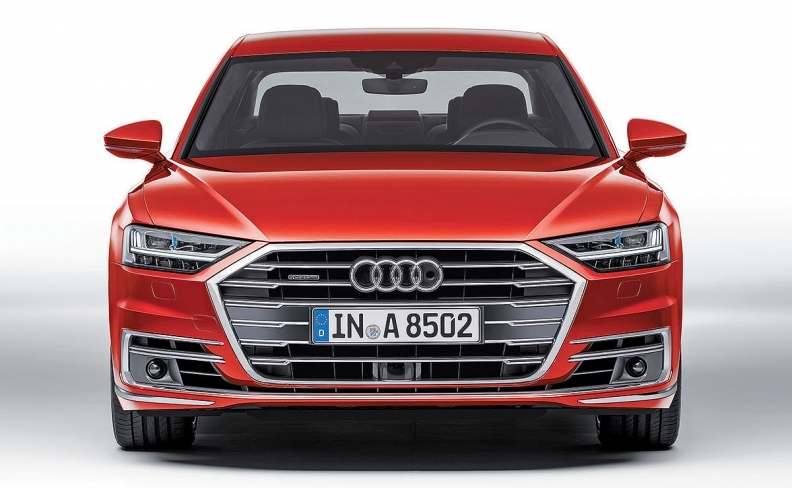 The Audi A8 was known for its aluminum, but now it's bulking up for crash strength. Audi's new A8 sedan made headlines this month for being the first car to promise Level 3 autonomous capability, but it had another tale to tell: a big reduction in the amount of aluminum in its body in favor of steel. Audi pioneered the use of aluminum as a bodyshell material for its first A8 in 1994, and it marketed the car on the lightness of its Audi Space Frame. The technology continued in later A8s and spread to other models. But aluminum content has significantly dropped in the bodyshell for this car, down to 58 percent, says Audi. That's compared with 92 percent for the outgoing A8, according to steel supplier ArcelorMittal, which hailed the switch as signaling a trend away from the lightweight but expensive metal and toward modern steel technologies. The result is a heavier body at 621 pounds vs. 509 pounds for the outgoing car, despite the use of carbon fiber for the rear seat back and parcel shelf. So why the switch? Three reasons, says Alexander Kobilke, engineering manager at Audi's lightweight design center in Neckarsulm, Germany. The most important is crash strength. New regulations plus protecting the battery for the plug-in hybrid called for high-strength, hot-formed steel to build the occupancy cell. It also helps torsional rigidity, up by 24 percent compared with the old car, Audi says. That helps handling. Lastly, steel has better acoustic properties, reducing cabin noise.